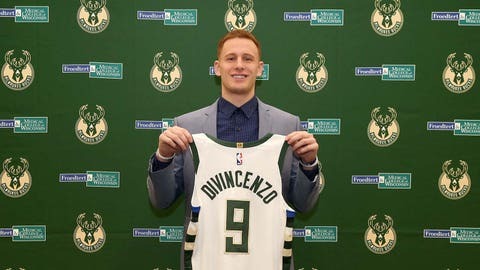 First-round pick Donte DiVincenzo brings a few things to the Milwaukee Bucks: a championship pedigree, a selfless style of basketball and — perhaps most importantly — two strong nicknames. Delaware is not — it should be noted — a basketball power of particular note, despite its recent publicity. Per the New York Times, the Delaware Sports Museum and Hall of Fame contains just 16 athletes inducted for basketball, including three referees. FOX Sports play-by-play man Gus Johnson added another moniker to DiVincenzo’s resume: the “Big Ragu” — in reference to his obvious Italian roots and red hair — after his tip-in beat Virginia 61-59 on Jan. 29, 2017. One thing he doesn’t bring to the Bucks? Positive memories of Milwaukee. DiVincenzo’s play in the 2018 NCAA Final Four earned him a major endorsement from, if not the Michael Jordan of Wilmington, N.C., then certainly the next best thing. First, a recap: a sophomore, DiVincenzo made a name for himself in the 2018 NCAA championship. He earned Final Four Most Outstanding Player honors after pouring in a career-high 31 points in a win over Michigan, the most anyone has ever scored off the bench in a Final Four game, adding five rebounds, three assists and two blocks for good measure, and going 5-for-7 from 3-point range. — He’s pretty big in Delaware. DiVincenzo graduated from Salesianum School in 2015 after leading the school to back-to-back state championships. — DiVincenzo is accustomed to thriving off the bench. He averaged 29.1 minutes per game last year, fourth-most on the team, despite starting in just 10 of his 40 games. — He redshirted as a true freshman at Villanova, appearing in just eight games before fracturing a metatarsal bone in his right foot. — He made the Big East All-Freshman team in 2017 and was named the Philadelphia Big Five Rookie of the Year in that same season. — He was named the Big East Sixth Man of the Year in 2018. — DiVincenzo turns in another headline-grabbing performance at the NBA Combine. His measured vertical leaps — 34 1/2 inches standing and 42 inches with a running start — were unsurpassed. — His dad was a Bucks fan in his youth. John DiVincenzo owns an old Ricky Pierce jersey — a good omen, perhaps, as Pierce won the NBA Sixth Man of the Year award twice — and asked his son to bring home some Bucks gear after his pre-draft workout in Milwaukee.